Vajra Master Jigme Dorje Rinpoche was born in Himalayas, Mugu village in 1972. Since childhood he was very interested in learn about Buddhism. 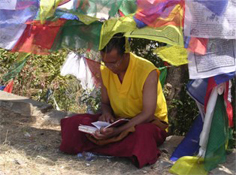 He learned reading, writing and basic Buddhism from his grandfather and also received refuge in the dharma from him. At the age of 13 he entered the Shechen Monastery and studied Buddhist philosophy and ritual practice under H.H. Dilgo Khyentse Rinpoche. Jigme Dorje Rinpoche received many initiations, oral transmissions, sutra and tantra from H.H. Dilgo Khyentse Rinpoche, Trulshik Rinpoche, Penor Rinpoche, Shechen Rabjam Rinpoche and other renowned Buddhist masters. He also entered the Buddhist university of Namroling Monastery in southern India over 3 years for further Buddhist studies. In 1998 he established “Ananda School” for Himalaya’s children in the Himalayan region of Jumla, Karnali zone of Nepal where around 90 students were able to receive modern education. In 2002 due to changes that were occurring within in Nepal, the school was unable to function any further. In 2005, Jigme Dorje Rinpoche established the Khawalung Monastery in Kathmandu, the capital city of Nepal. Currently, there are more than 50 young monks drawn from the population of Himalaya’s children. Included in this group are orphans and others are from poor families. They study Buddhist philosophy, ritual, meditation and also receive modern education. The monastery gives special emphasis to the terma (esoteric tantric teaching) of H.H. Dilgo Khyentse Rinpoche. Jigme Dorje Rinpoche works to provide food, clothing, education, medical care and shelter. In 2007 he established a nonprofit organization called Khawalung Foundation USA in New York City in order to raise funds to help maintain those young monks of the Khawalung Monastery in Nepal, assist other children of Nepal and also spread the Buddhist teaching of compassion in America and the West. In the future, Jigme Dorje Rinpoche wishes to build a Khawalung children’s home in Kathmandu for children who do not wish to be ordained as monks but wish to be educated. This facility will also house the former Ananda School and will give a modern education to up to 500 Nepalese children, both orphans and children of poor families. In addition, the Lama also envisions the building of a facility for the elderly which will not only provide for their daily living but also will house a medical clinic for the general population as well. Jigme Dorje Rinpoche is the direct descendant of Yogi masters. His grandfather was Yogi master Choying Wangpo Rinpoche and his father is Dudul Dorje Rinpoche. Karma Choying Wangpo Rinpoche was born in karnali zone, mugu village in 1900. He began to learn reading, writing and Buddhist texts, and received his upasaka (vows), as a child from his root teacher Yogi Lama Karma Gyaltsen. He continued advanced training in Vajrayana. He received numerous initiations and oral transmissions from his root guru as well as from H.H. Dudjom Rinpoche, Serta Rinpoche, one of the main disciples of Dujom Lingpa and Thangdom Lama. After he completed his of study on Vajrayana, he began to meditate and practiced continuously in various places in the Himalayan region. 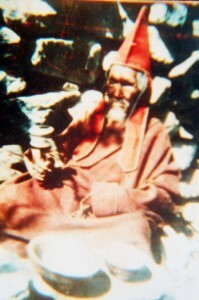 His final meditation place is in Khawalung, Mugu. There he meditated deeply, profoundly and practiced the secret dharma of Dzogchen. When he received the power of Dzogchen dharma he was able to communicate and receive teachings from beings from the three other realms of existence . After about 25 years in meditation, at the age of 87, he passed away from this realm in Khawalung with many auspicious signs and his body stayed in a state of meditation for three days. Lama’s father, Dudul Dorje Rinpoche, son of Karma Choying Wangpo Rinpoche, was born in 1935 in Khawalung, Mugu village. Since his childhood he learned reading and writing from his father, as well as receiving his vows from him. He studied Vajrayana and received oral transmissions and initiations from his father, received the Kalachakra initiation from H.H. the Dalai Lama as well as other transmissions of the Nyingmapa tradition from H.H. Dudjom Rinpoche, H.H. Dilgo Khyentse Rinpoche, H.H Penor Rinpoche, H.H. Trulshik Rinpoche and other masters. He has been teaching and giving initiations to the public and has done so to over a thousand people all over the Himalayas. He has been in meditation and Dzogchen practice for over eight years in a Khawalung meditation cave in Mugu village. He is now 78 years old and is still practicing dharma in the village.